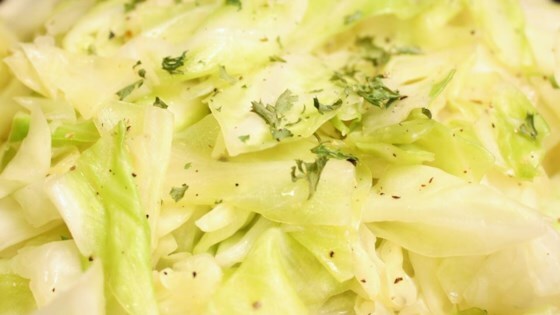 "A favorite old Irish family recipe for fried cabbage and it's so easy." Bring the butter and chicken broth to a boil in a large skillet. Reduce heat to low and add the cabbage. Cover and cook over low heat to steam the cabbage for about 45 minutes, stirring frequently, or until cabbage is tender and sweet. Season with salt and pepper and serve. This was good but it is not fried cabbage. I diced onion and lightly sauteed in butter before adding the chicken broth. This is very, very good. For a nice change, try adding crumbled bacon. Yummy! I added fried, crushed bacon and seved the cabbage over potato dumplings. really delicious, added some cayenne pepper for heat and used veg boullion instead with a bit of soy sauce.